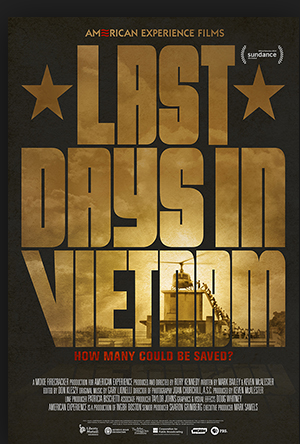 Last Days in Vietnam-sp– Even if you were around in 1975 during the U.S pullout from South Vietnam, the true story of how it went down is probably not the way you remember it. Even that iconic photograph of people climbing up a ladder into a helicopter from what you thought was the U.S Embassy was not the U.S. Embassy. Rory Kennedy, youngest daughter of the late Robert Kennedy is a documentary filmmaker who realized that there was an interesting story here to be told. Together with her co-producer Keven McAlester and their team she researched the subject, dug out archive documents and film footage, followed leads, set up interviews with former CIA agents, American soldiers, as well as Vietnamese who got out and some that didn’t. She also was able to interview one of the key surviving players who surrounded and advised President Ford during those final days. That was none other than Henry Kissinger who had been Secretary of State for both Ford and President Nixon. Nixon actually looks quite good in the view of the historical circumstances, which are presented here. It was under his watch that the peace accord of !973 was signed which was followed by the withdrawal of US Troops. We are then shown in 1975 shortly after Nixon resigned from office that the North Vietnam troops began the march towards Saigon. The implication was clearly stated that they would have been afraid to do so if Nixon were in office. We then see how President Ford was not able to get Congress to raise money to support any effort to stop this new aggression. The real story here was the denial by U.S. Ambassador Graham Martin of the threatening attack that was underway, spilling down towards Saigon with the ultimate evacuation of all the Americans and the desperate attempt to get out bythe South Vietnamese who were connected to the Americans. 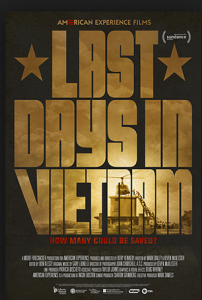 Rather than use an authoritative narrator, the filmmakers chose to use the faces and the voices of the Americans and Vietnamese who lived through those harrowing days who told their own stories. The latter group knew that if they did not get out, they stood a good chance of being killed or severely punished. In fact in the final credits we learn that some of these narrators subsequently spent years in “ reeducation camps” before making their way to the United States. We learn that the final dramatic evacuation was not only by helicopter but also by sea. The helicopters flew out thousands of evacuees to a flotilla of ships led by the USS Kirk. A good documentary often relies on some fresh views of the historical event. In this case, that was not only provided by American and Vietnamese survivors of this unusual evacuation telling their tales but also by the discovery of a box full of 8mm movie film taken by one of the sailors aboard the USS Kirk almost 40 years ago. These movies provided a vivid picture of the thousands of civilians packed aboard these ships as they attempted to get to Manila. They also showed a never to be forgotten sequence of movie scenes of a gigantic Chinook helicopter that was too large and heavy to land on the US ship. Instead the Vietnamese pilot who was trying to save his family and others had to do a remarkable maneuver where he hovered so his young children could be dropped and caught by the sailors below. He then did what experts feel was an extremely difficult task of climbing out of his pilot gear, ditching his gigantic helicopter into the sea with its spinning blades disintegrating, while he jumped out into the water and swam to safety of the nearby vessel. This amazing accomplishment was narrated by his now grown son who had been seen as one of the young children being dropped out of the Chinook. There were several moral questions raised by this film. The big question was did the U.S. have a commitment to its ally, South Vietnam when the North Vietnamese broke the Paris Peace Accord and invaded South Vietnam. What was the meaning of the refusal of Congress to provide funds and the failure of the President to send troops back there? Did the U.S have a commitment to the many civilians and their families who had worked for the US and would be targets if they were not evacuated? Were several U.S. officers within the embassy wrong when they disobeyed orders and organized secret “ black opps” plans for evacuating civilians when the Ambassador had not authorized this to be done.? There also was a promise to all those Vietnamese who were allowed to enter the U.S. Embassy grounds for evacuation, that they would definitely be rescued. However once the Ambassador left, after most of the people were evacuated, there were 420 Vietnamese left behind who had been promised evacuation. Finally, is there any lesson here that we can glean that can be applied to the current situation in Iraq and Afghanistan where the U.S. has left and now the situation is deteriorating?